4 F 2 3rd fretfr. 3 Bb 3 3rd fretfr. 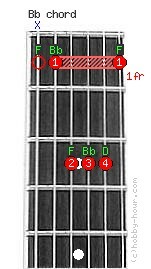 2 D 4 3rd fretfr. Chord Bb notes: (F), Bb, F, Bb, D and F.
Bb(A#) major chord's alternative names: BbM, Bbmaj, Si bemol major, Bb dur, A#M, A#maj.